This is an oil bar painting in progress, inspired by a photo that I took back in August at Obear Park here in Beverly MA (posted here a few days ago). I didn't have a lot of time to paint this morning, so I just worked on revising the composition. I focused on the sky, moving the cloud formation down further, and then making room for a streak of light near the top of the canvas by moving the yellow streaks of light down and making them smaller. I wasn't worrying much about color, just shape and composition. This is a work in progress, an oil bar painting that I started yesterday. I am using one of my photos as a reference: a picture of the sunset that I took last year from Obear Park, here in Beverly, MA. (posted here on March 28.) I am not trying to create an exact copy of the photograph, but I am using it for inspiration and an aid to understanding what is happening visually in this scene. This morning I worked on this painting for about an hour, making some corrections in the basic composition that I roughed in yesterday. I changed the size and position of the land mass and changed the position of the cloud formation. I am not worrying too much about color and perspective at this point, just trying to get the basic shapes in the right place. It is easier to "see where I am" in a painting if I use strong colors and basic shapes at the beginning. The rays of light in the sky (and reflected in the water) are still large and exaggerated, but I will make them more subtle later on. Today I started another oil bar painting, using the photo that I posted here yesterday as a reference. The scene is an amazing sunset that I photograph from Obear Park, here in Beverly, MA. This morning I worked quickly to rough in a general idea of the composition and to lay down a base for the colors, without trying to show depth, scale, or modeling. Even with that said, I already have a long list of things that I need to move, change, and adjust. I still find it pretty daunting to post a painting in such an early stage. But it is useful to do it, and it feels good to get this started. It's time to start another painting. (I have a show coming up in May.) I have been thinking about a series of photographs that I took last August from Obear Park, here in Beverly. It is a little unusual to find a location around here where can get a view of the western sky over the water. One night last August, the sky was amazing, and I shot a series of photos as the sun was setting. Today I picked this one out to use as reference for my next painting. But I needed to make some adjustments. First, I used iPhoto to light the shadows enough so some of the houses along the shore would be visible, because I want to include them in the painting. Then I used Painter to posterize the image. I posterized the houses with a high effect, but the sky and the water are posterized just enough to make the shapes and colors more obvious. Then I cropped the image for a square format because the all the paintings for this show are going to be 20 inches by 20 inches. So here is my reference photo. Nothing to do now but start painting. 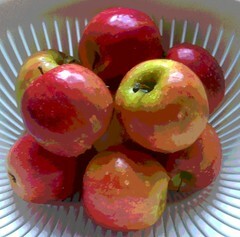 Tonight I used Painter to posterize the photo that I published here yesterday, a picture of "Pink Lady" apples that I took with my iPhone camera. I used a strong posterizing effect to capitalize on the colors of the apples and the pattern of the colander. Yesterday I bought a bag of apples at the grocery store. They were on sale, and looked great. Besides, I liked the sign: Pink Lady apples, (also known as Cripps Pink, which was how the bag of apples was tagged.) "The Pink Lady" was a notorious night club in my home town, with a big neon sign on an old highway on the outskirts of Pueblo, Colorado. References to the infamous "Pink Lady" peppered the conversations among older high school students hoping to sound like they were 'in the know', even if they had never actually set foot in the place.) So the name made me laugh, which clinched the sale, and I bought the Pink Lady apples. Today they looked so good in the colander that I took a picture with my iPhone camera. Tonight I used iPhoto to crop this composition out of the original photograph. 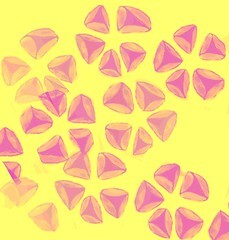 Yesterday I posted a digital sketch that I made on the iPad using the Brushes app. 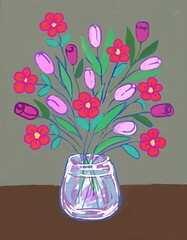 I worked from my imagination and drew a bouquet of spring flowers. This is the stroke-by-stroke video captured by Brushes as I drew yesterday's sketch posted. Today I used iMovie to add stills of the final image to the video as well. Tonight I took a break and started a sketch on my iPad. I just wanted to get some practice in with the Brushes application, so I started a little sketch of a bouquet of spring flowers, working from my imagination. (No real spring flowers here north of Boston, where the weather today was cold enough for snow flurries!). Anyway, this sketch took a lot longer than I intended, probably because I made it way to complicated as I began. Finally I used blue on my digital brush to correct some of the lines and to help me see where things were. I liked the look of the blue outlining, so I left some of it in, and did more outlining using other colors. I liked the result, and here it is. Tonight I used Painter to create this posterized version of the photo I posted yesterday, tulips on sale at BJ's. I took the original photo with my iPhone camera. 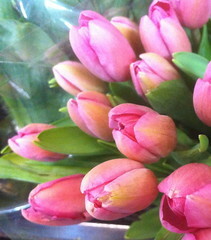 (Well, snow is predicted for tonight, so sometimes you have to settle for spring in the grocery store.) The posterizing is subtle because the white highlights were emphasized too much when I did a lot of posterizing. Finally I realized that I could use color overlays to get rid of the white highlights that I didn't want. According to the calendar, it's officially spring, but here north of Boston, we've had wintry weather for the past two days. Yesterday we even had snow! So sometimes I look for signs of spring in the grocery store. Tonight during a BJs run, I saw some tulips on display, so I got my iPhone out and took some pictures. When I got back home, I loaded them into the computer and cropped this image out of the best of the pictures that I took tonight. 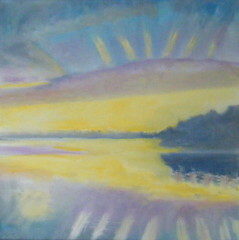 This is my oil bar painting as it looks now. 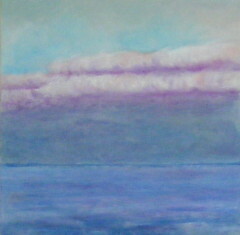 Today I added some more pink and purple tones to the area above the cloud formation. I scumbled the paint on in little dabs, trying to get the iridescent effect of a sky that is pink and blue at the same time. I now think that this painting is finished. I think I have taken this one as far as I can. Of course, as soon as I say that, I usually see something I want to change. But I will say it anyway. Besides, it is time to move on to the next painting. 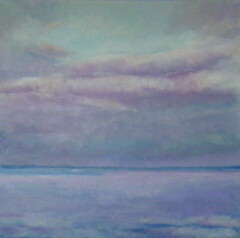 Today I worked on this oil bar painting, a landscape of the Atlantic Ocean at twilight. I am using a photograph that I took from Beverly's Lynch Park as a reference. I adjusted some of the colors and shapes in the cloud formation and in the sky above the clouds. I also added just a little definition to suggest the islands on the horizon line. I still call this a work in progress because I may make some changes, but at this point, I think they will be minor. I think this painting is close to being finished. And that's a good thing because I am getting ready to start another painting this week for a show that's coming up in May. 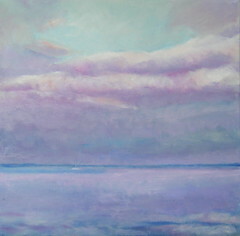 This is my oil bar painting in progress, a landscape of the ocean and sky at twilight. 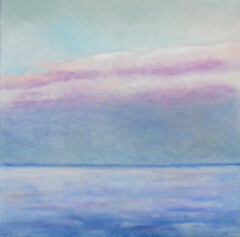 Today I worked mainly on the sky above the cloud formation. I am using as a reference the photo that I took from Lynch Park here in Beverly, MA, and it is a very helpful tool as I struggle to get the colors right. I brought the saturation of the blue sky down, and mixed it with more white, gray, and purple tones. I also modified some of the shapes in the cloud formation. The sky above the clouds already looks better but there are still changes I plan to make. Purim is almost here, which inspired me to make this piece of digital art today. Last year I made a drawing of hamentashen (triangular cookies filled with jam), and used Painter to capture a pattern from the drawing. This afternoon, I used the pattern with Painter's pattern pen. I worked in digital chalk on yellow "canvas", then cropped to get this composition. Then I posterized the image, and here it is. I had a chance to work on this painting this morning. I am just beginning to feel like I might be on the right track. I have always been fascinated by the way the sky changes color or can seem to be several colors at once. And of course, the ocean reflects the colors in the sky while its own color shows through. Add the colors of twilight and you get a pretty complicated problem, or at least it seems complicated to me. Now that the basic composition is blocked in, I am using the reference photo (a picture that I took from Beverly's Lynch Park at twilight) to understand what is going on with the colors and shapes. (I posted a copy of the reference photo here last night.) This is detailed work, and slow going, but I feel like it is going to pay off. I didn't have a chance to paint today, but I am posting the reference photo that I mentioned in yesterday's post. This image began as a photo that I took at twilight in Beverly's Lynch Park, and I have been using it as a reference as I paint. I am not trying to create an exact copy of the photo, but what I am trying to capture is the play of colors on the water and in the sky. The similarity of the values and hues at twilight makes this a challenging painting despite the simplicity of the composition. Now that I have the general composition roughed in, I am paying closer attention to the shapes and colors in the photo so as to understand what the light is doing on the water and in the sky. I was already working from a lightly posterized photograph, but because the colors and subtle shapes are hard to discriminate in the photo, yesterday I used Painter software to create a version of the photo that is posterized with a strong effect. (Posterizing simplifies shapes and strengthens the demarcations between colors.) I played around with the posterizing levels to get a version with more visible demarcations but without distorting the color. (When I was younger, when I was drawing I used to throw my eyes in and out of focus at will to see the general patterns of colors and shapes. I am long past being able to do that now, but using a posterized photo helps me in similar ways.) As a bonus, the posterized reference photos can be interesting in their own right, and sometimes I even include them in art shows. This is an oil bar painting in progress. I didn't get a chance to work on it until after dinner, which isn't the best circumstance. But I was eager to work on it, so I did. I am working from a photograph that I took at Lynch Park, here in Beverly, MA. 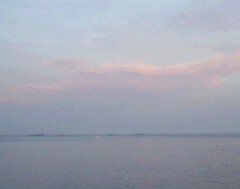 The sun was setting in the west, but it turned the eastern sky pink, and the water reflected the colors. I am now at the point of being able to work more closely from the photograph, using it as a reference for the the colors and shapes. The values and colors are so similar in this photo that it is hard to see what is going on. So earlier in the day, I created a version of the photo that is posterized at a high level, which simplifies shapes and colors. (I will post that too, maybe tomorrow or the next day). Despite working in artificial light, I felt like I was making progress tonight. So I also photographed it tonight (again, not ideal), but here it is. The low light makes it look at little darker than in the daytime. 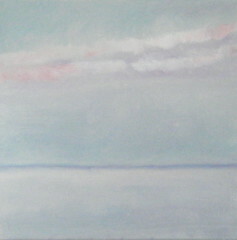 This afternoon, I worked on this painting, a view of the ocean at twilight. I am working from a photo that I took from Lynch Park here in Beverly. 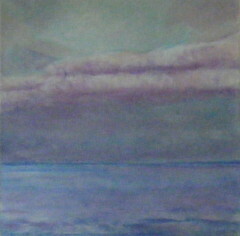 Today I added some dark tones to the water and to the sky below the clouds. I am still struggling to get similar colors above and below the horizon line, but I hope am getting there. However, it may appear that I am going backwards because the light on the water is now gone. 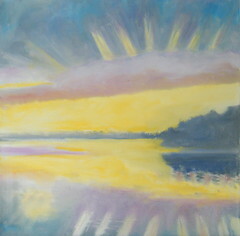 But once I get the colors right, I will add light to the water again, as well as to the sky below the clouds. I didn't do anything to the sky above the clouds today, so if that part of the painting seems not to "match" the rest of the canvas, that is why. (Can you tell that it is a little frightening to post a painting in progress? Maybe it is scary for those watching, as well!) Today I also reworked the shapes in the cloud formation. Now I am happier with the way the clouds look. 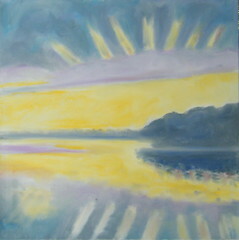 This is the oil bar painting I am working on as it looked when I finished painting this afternoon. Today I used a very dark blue oil bar to add some dark values and increase the contrast. 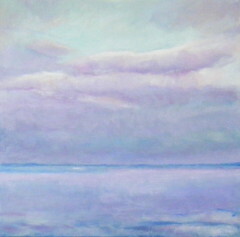 I also modified some of the shapes in the cloud formation, and began working on the water. I am using the photo that I took as a reference for the colors (posted here last week). The composition is simple, but getting the colors right is complicated. This is an oil bar painting in process, a landscape roughly based on a photo of the ocean that I took from a beach here in Beverly. I started this painting yesterday, and progress seemed pretty fast. 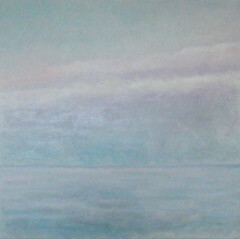 Today I revised the composition, moving the cloud formation down on the canvas. I also worked on getting some of the values to be darker. The result of that is less contrast, so at the moment, this image has less definition than it did yesterday. This might not look like progress, but I am making haste slowly. It is easier to correct the composition at the beginning. This is an oil bar painting that I started today. This is a painting of the ocean as it looks around the time the sun goes down. For inspiration and as a general reference, I am using a picture that I took from Lynch Park, here in Beverly, MA. (See the image that I posted March 8.) I was interested in the light, the colors in the sky and on the water, and that dark blue horizon line. 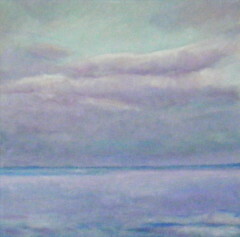 The colors are more subtle than the sunset in the west, but the light and colors are reflected on the water and in the eastern sky. What I managed to do today was just rough in a composition and the basic colors. This might look simple but I doubt that it will be easy. I already see things on the canvas that I want to modify. But I am very happy to be painting! This is a pastel still life that I came across today while I was straightening up my studio and making room to set up my easel so I can paint this weekend for an upcoming show. Of course I got distracted, and looked in some of my sketchbooks, which is where I found this drawing. I drew this picture at least five or six years ago, when I belonged to a drawing group that had weekly drawing sessions in members' homes. The still life set up was provided by that week's host. Today when I found this drawing, I checked and saw that I didn't have a photo of it, so I decided to take a picture and post it here tonight. Although there are things about this drawing that I would like to modify, such as the quirky composition, it was a good drawing "workout". 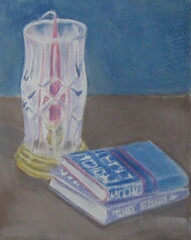 It's clear that I spent a lot of time on the cut glass, but I think the books needed more attention. (We drew for two hours and that was it.) Perhaps this drawing is a candidate for another 'pastel make-over' at some point. . . . Here's another of the images I created yesterday while I was trying to remember how to work with layers in Painter. 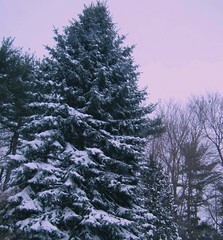 The photo is a picture of a blue spruce that I took on February 3rd, this time with a blue overlay. This is an image that I created from a photo today with my Painter program. Inspired by a demo that I saw this morning at the Apple store, I decided to try my hand at using layers in Painter. 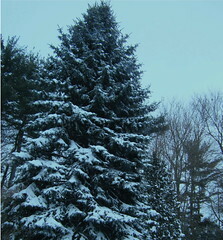 I used a photo of a blue spruce that I took on February 3rd. It has been a long time since I tried to use layers and the software has changed, so I really fumbled around a lot and didn't accomplish too much. But I will keep trying. Meanwhile, while I was trying to learn this new process, I created two images of the blue spruce tree. Here is one of them, with a pink cast. Today I was looking through my photos for images to use for oil bar paintings. I have a show coming up and I would like to add a few more paintings. 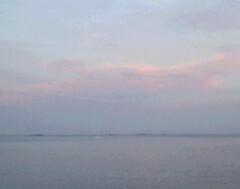 I found a photo that I took back in May, 2009, a view of the Atlantic Ocean taken from a beach here in Beverly, MA. I am going to use this as the basis of the oil bar painting that I plan to start this week. This afternoon I opened Painter and made this posterized version of the photo. Posterizing makes the colors and shapes easier to see, so it helps for painting, but I also like the way it looks. Sometimes I display the posterized photos as well as my paintings (but in a separate area, not side-by-side). The image looks simple, but it is far more complex than it first appears. I am eager to get started. 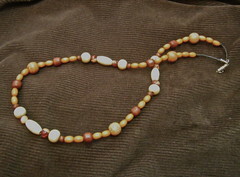 This is a necklace that I made today, assorted wooden beads on a leather cord with a magnetic clasp. Sometimes while I am making one necklace, I get an idea for another one. That is what happened in this case. 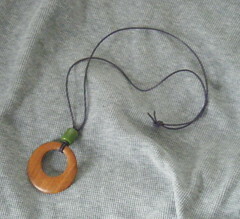 Yesterday I made a pendant with a wooden circle. As I was looking through my beads to figure out what would go with it, I saw some wooden beads that I bought a couple of years ago at a bead store in Lake Placid. So today I started creating a necklace with those beads, which are very different because they are stained to show the wood grain, and in some cases, they are stained with other patterns. I added some other wooden beads, and put this necklace together. That sounds simple, but it wasn't. Even though I behaved myself this time and used a design board, I had to revise the design twice, and I also had to restring the whole thing because I had problems with the clasp. At that point I was very frustrated, but I was happy enough with the end result. I made this necklace today using a wooden circle, a green glass bead, and a purple leather cord. The basic idea is simple, and so is the construction, but getting a pleasing arrangements of shapes can be tricky. I tried a number of combinations before deciding on this one. This morning I decided to sketch an idea for a drawing that came to me during recent snow storms. 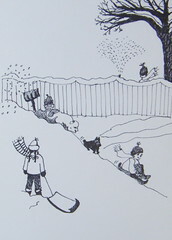 This is from imagination, but is a composite inspired by neighborhood activities: the snow blowing up over the fence from one neighbor's snowblower and the kids sledding next door on a big mound of snow while Dad shovels. Their dog really does join in the fun! I added our little schipperke to the picture because she likes to slide downhill too, although she has never had a chance to try her skills on the big "ski slope" next door. This is a photograph that I took with my iPhone camera back on February 19 when my daughter and I toured the studio spaces at Porter Mill (formerly Red Brick). The building is going to reopen with art studios and we were picking out a space, hoping to get our first choice. We did, and today I can say officially that this will be our new studio, though move in isn't until May 1. 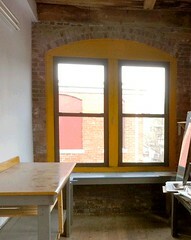 This photo shows two of the windows, but it has six windows, and because it is on the top floor, has even more light. Tonight I cropped this image out of the original photo and used Painter to adjust the exposure. 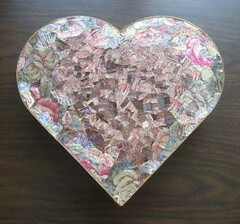 This is the collage and decoupage project I completed earlier in the week, a heart-shaped box covered with designs made from printed metallic ribbon. This photo shows a view of the back (underside) of the box. It is actually my favorite part, but least likely to be seen. I will miss working on this project. This project has taken much longer than I thought, so it has been an exercise in patience and perserverence. It has also been a kind of meditation on the possibility of creating something one small choice, one small action at a time. But that's true of all art projects, and it is time to move on to the next one. 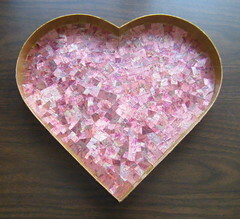 This is the collage and decoupage project that I finished a few days ago, a heart-shaped box covered with designs that I made from bits of printed metallic ribbon. This photo shows the inside of the lid. I used metallic gold-colored acryllic paint to cover the inside wall of the box top.